We're proud to offer top quality, 100% American flags in our store. Whether you're looking for flags of the Western States or a nice rendition of Old Glory, we have what you're looking for. If you know what you're looking for, click on one of the links below to jump directly to what you're after. Otherwise, feel free to scroll down and take it all in. 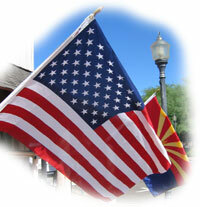 Made to last, these commercial grade flags have a heavy canvas heading and brass grommets. Special dyes produce brilliant color that is resistant to wear from the sun and rain. All logos and emblems are reproduced using a high-resolution process that ensures even the finest details show. Best of all, these flags are 100% American made.